Figueres, Spain is quite far to go to 'just' see a museum (albeit an amazing one), though the AVE train has made the travel times much shorter than they used to be. But still, combining your visit to the Dali museum with other sights in the area would be difficult if organizing it by yourself. For this reason alone, we recommend taking a guided tour—the expertise you get from your guide and the benefit of jumping the line is extra. By train: With the new high-speed AVE train from Barcelona to Figueres, the journey now takes just 53 minutes. The train departs from Barcelona Sants station, but you can pick it up at Passeig de Gracia. With little else of real significance in Figueres, it is a good idea to get an early train to the town and be out again by lunchtime so you can still enjoy the afternoon back in Barcelona. By car: The excellent train connection now makes hiring a car less attractive, but it is still a good alternative. You could then visit, for example, the town of Portlligat, where there is another Dali museum, or relax on the beach (in Roses, for example). This wouldn't be possible in a day by public transport. By bus: The bus is not practical. By train: With the high-speed AVE train from Girona to Figueres, it is now possible to make this journey in just 14 minutes. By bus: There is a bus from Girona to Figueres, run by the Sagalés bus company. However, it is infrequent and no cheaper than the train. By car: Take the AP-7 toll road from Girona to Figueres. By train: The train from Perpignan to Figueres takes about 1h15 and costs just over 30 euros. It is a little cheaper if you change in Port Bou Espagne. By bus: Linebus has a bus once a day from Perpignan to Figueres. The journey takes an hour and costs 24 euros. By car: The 60km drive from Perpignan to Figueres should take about 45 minutes. Take the A9 and AP-7. These are both toll roads. Once you've done the Dali Museum, there are a few other things you could try. Dali's place of birth is also in Figueres, but it is only really of historical interest. There is also the Toy Museum of Catalonia if that is your sort of thing. A local museum of archaeological artifacts. The Port Lligat Dali Museum, a smaller museum dedicated to Salvador Dali, can be found in Port Lligat, Cadaqués. The museum is in a former house of Dali, who lived there from 1930 until the death of his wife in 1982. There are buses from Figueres to Cadaqués but they are irregular and unreliable, so your own transport or a guided tour are your best. Cadaques is a picturesque town in itself and for some two Dali museums in a day would be a bit much. 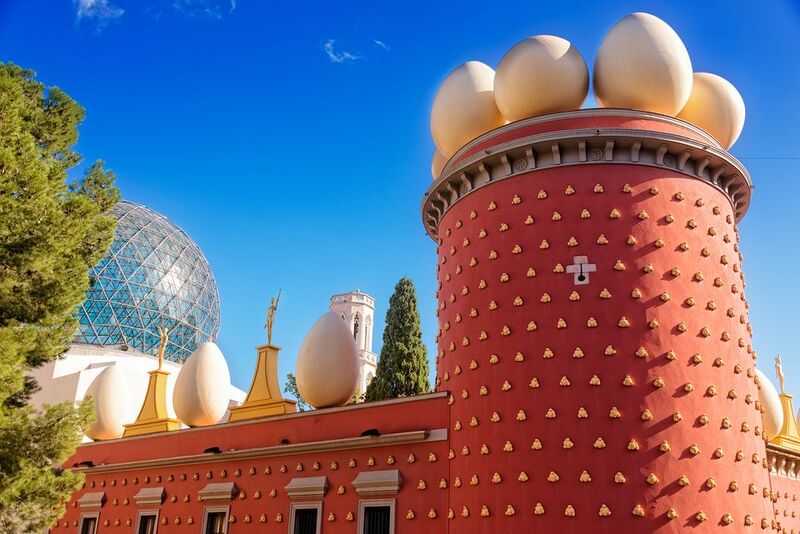 Gala Dali Castle in Púbol: A shrine to Dali's deceased wife and Dali's home in his own final years.